In honor of one of my personal icons, Freddie Mercury–whose birthday was yesterday, BTW–I threw together a few looks inspired by a few of the talented singer, song writer and performer’s stage ensembles. Freddie was through and through a showman, and his wardrobe choices both on and off the stage were bold and graphic. I tried to capture a little of that flair and flamboyancy that made Freddie’s style so iconic. Bold stripes, bright colors, leather and studs and vibrant contrasts were all signatures of Freddie’s look. How would you recreate Mr. Mercury’s look? it is not easy, letting things go, but I’m beginning to realize that carrying all these old hurts around with me has left me buried in the mud up to my thighs. i’m starting to set them aside, but it’s hard not to mull over them as i begin to untangle the heavy ropes binding them to me. there’s a lot of pain in a life. there’s a lot of disappointment. and sometimes it’s easier to focus on those things; those epic wounds, those brutal battles. sometimes, it’s not even easy, sometimes it’s just all you can see. sometimes it may seem as though these things define you. that they shape your life with their pressure, mold your world with their weight. i’m beginning to realize that the only way they can do this if you allow them to. that weight is on your shoulders because you refuse to shrug it off. you keep it there with ropes that bind you to your pain. all the things you are unwilling to forgive or forget. they only define you because you keep them close. i am beginning to unravel all the stings I have attached. the things keeping me tied to these ancient grudges. i hope in cutting them free i will find some peace. Sometimes things just seem to pile up on top of each other…until you’re afraid you won’t be able to stand up under the weight. 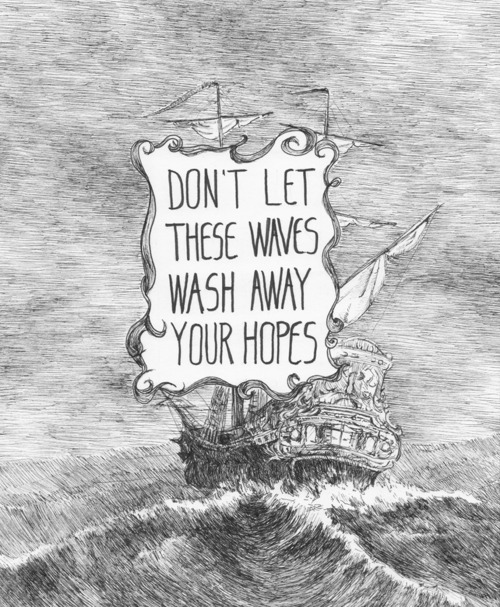 Trying to heed the advice of this lovely ink drawing by the talented man behind Sunday Best and Broken Glass on tumblr. Keep your heads above the water. This too shall pass.